This is the Icelandic cartoonist Hugleikur Dagsson. 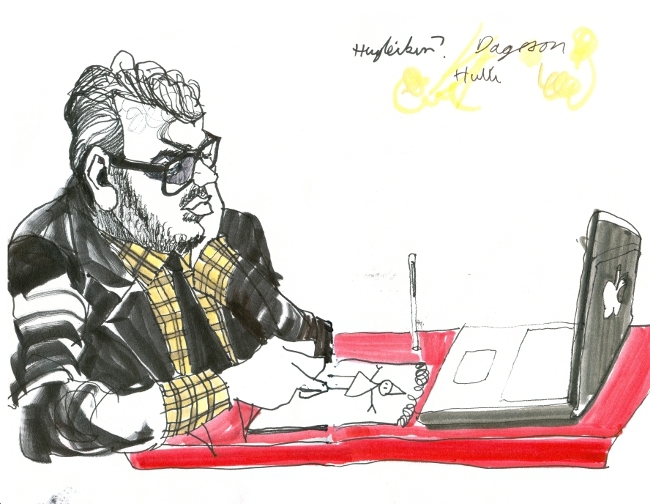 I drew him while he was at work in a corner of Súfistinn café on Laugavegur, Reykjavík. He’s made a career out of drawing stick figures, hilarious stick figures. Thanks Rosie. Your egg n’ chips post had me longing for home. Regards to Hubby and Sparta, Russell. This is great! Seems like a real character. I must google him too. Reminds me of the time I saw quite a character sitting sketching at a table in a very shopping centre food court. From a distance I could see he was very talented, but was too shy to go over and have a closer look. Wish I could have sketched him instead, with as great a skill as yours! Thank you. Yes, he was fun to draw, and sat quite still which helps. You should of talked to the sketcher, I don’t mind meeting when I’m out drawing, it gives me a little break. All the best for the week ahead, Russell. Cheers Martin, I’m trying to work more in colour now, without loosing the speed. Watch this space! Russell. This is marvelous! I bet he would love your drawing of him! Thanks Jen, I guess you like the colour here. I didn’t think about that, maybe I should send the drawing off to him? Russell. Whoa. He’s waaay ahead of my game. Thought you might like it. Have a great week-end. Russell.